Jumping rope is an easy and inexpensive way to burn calories, strengthen the upper and lower body and promote heart health. If performed properly, this simple aerobic activity may help strengthen feet and arches, especially in children. If performed improperly, it may lead to injury or exacerbate existing foot problems, especially plantar fasciitis. 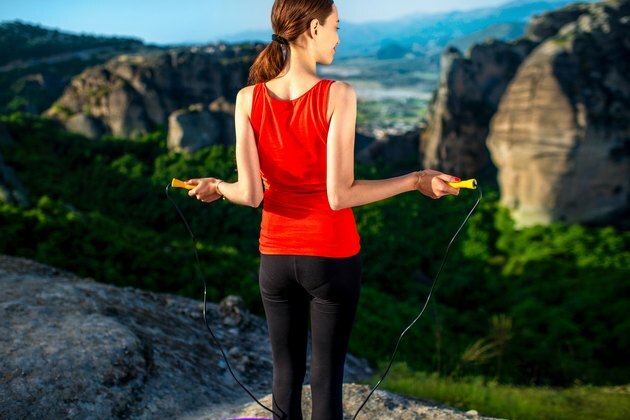 Proper form while jumping rope will lessen the likelihood of injury. Roger Crozier, a physical education teacher who coaches a competitive jump-rope team in San Antonio, Texas, recommends not jumping more than 1 inch off the floor and staying high on the toes to absorb the shock. If done properly, rope-jumping is a lower-impact activity than running or jogging, according to Crozier. The Jump Rope Institute recommends wearing cross-trainer shoes when jumping rope to prevent falls and other injuries. Jumping rope is one way a child with flat feet can strengthen the feet and form a natural arch, according to Hesperian, a nonprofit publisher of books and newsletters for community-based healthcare. Having the child walk barefoot on sand or other rough surfaces, tiptoe or pick things up with the toes are other recommendations for flat feet. These exercises are more effective than the use of insoles, according to Hesperian. Flat feet in children are usually not a serious health problem if there is no pain and the child is able to move his feet in all directions. Insoles should be used only in cases of severe flat feet. Plantar fasciitis is an inflammation of the arch-supporting ligament that runs from the heel to the ball of the foot. More than 95 percent of heel pain is diagnosed as plantar fasciitis, according to Feet for Life Podiatry Centers. Symptoms include pain in the bottom or inside of the heel during standing. Rope jumping may be one of the actions that causes and continues to aggravate this condition. The website PlantarFasciitis.org advises avoiding jumping rope or running after a diagnosis is made. Consult with a doctor regarding when to resume exercise after recovery. Rope jumping is an effective way to burn calories, strengthen your upper and lower body and improve heart health. This high-aerobic activity is an appropriate exercise for fit individuals, but it can put stress on your knees, ankles and hips. If you have doubts about whether rope-jumping should be part of your routine, consult with your doctor.